Summary: Project X Zone is a crossover strategy RPG featuring series from three different game companies (+ one extra). 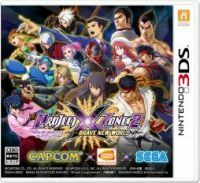 Capcom's Gyakuten Saiban (Ace Attorney) too joined the crossover in 2015's Project X Zone 2: Brave New World. 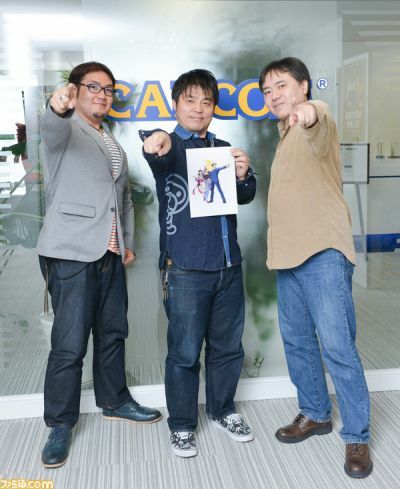 In this Famitsū interview, originally posted on November 6, 2015, PXZ2 director Morizumi Souichirō and producer Tsukanaka Kensuke are joined by Capcom's Eshiro Motohide to talk about how they got Gyakuten Saiban in the game and the things they had to look out for. Topics include scrapped ideas, how the Gyakuten Saiban characters were included in the story, what is difficult about working on a crossover title and sprite art. Interviewer: Could you first tell us how you came up with the idea of having characters from the Gyakuten Saiban (Ace Attorney) series appearing in Project X Zone 2 (PXZ2)? Tsukanaka: Well, because the Gyakuten Saiban series was mainly released on Nintendo hardware, I thought that it would fit PXZ2 very well. Actually, we actually already had the series in mind as a possible contender for the first PXZ, but because that was around the time Gyakuten Saiban had a collaboration with Level-5’s Professor Layton, so we had to give up on that for the moment. So for PXZ2, we tried asking Capcom again, and with the time ripe, the series’ inclusion was decided. Morizumi: First we wanted to have all the famous characters from Gyakuten Saiban appear, like Yahari Masashi (Larry Butz), Karuma Mei (Franziska von Karma) and Obachan (Wendy Oldbag), but then thought it might be difficult to have characters who have never fought appear in battle. That’s why we decided to have the Naruhodo (Phoenix Wright) and Mayoi (Maya Fey) from Ultimate Marvel VS. Capcom 3 (UMVC3) as our base, as we all knew the game. But if we’d just copy that, people would say it’s exactly the same as UMVC3, so we came up with a battle scene that included characteristic Gyakuten Saiban keywords like Tonosaman (The Steel Samurai), Himesaman (The Pink Princess) and the Psycho Locks (Psyche Locks), which look really nice on the screen. Interviewer: So it was easier to imagine what the battle scene would need to look like because UMVC3 had been released before. Morizumi: You can say that. Gyakuten Saiban is originally an adventure game, a completely different genre. So it was a huge help that the characters had already appeared in UMVC3 and fought there. The users too would think: ‘Oh yeah, Naruhodo once fought with Magneto,’ making it easier for them to accept the premise. 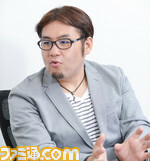 Eshiro: It was definitely important that they had already appeared in an action game. The first time they came asking us, the company accepted it immediately, with ‘They already appeared in an action game, so why not?’. With characters besides Naruhodō Ryūichi and Ayasato Mayoi, it might have been more difficult, deciding how we’re going to have them join the action. Karuma Mei has a whip, so it might’ve been easy for her to fight though (laugh). Morizumi: Obachan has her beam gun (laugh). Eshiro: But it doesn’t shoot any beams (laugh). Morizumi: We had ideas like having Yahari through the statue of the Thinking Man, that was once used as a murder weapon, but we would have to explain that in the story. That is why in the end, we decided on using the duo of Naruhodo and Mayoi like they appeared in in UMVC3. Eshiro: By just keeping it simple, with just Naruhodo and Mayoi, you don’t have to explain that much, and it makes the other characters also stand out better in terms of story. I think the two of them is just the perfect balance if you want to have Gyakuten Saiban appear in the game. Interview: How was it supervising the action scenes, like the battles of these two characters, who usually don’t fight at all? Morizumi: That’s right. All series have slightly different ways of saying things, so we had to take lots of notes to get that all right. Interview: PXZ2’s release is right between Dai Gyakuten Saiban (‘The Grand Turnabout Trial’) and Gyakuten Saiban 6 (Ace Attorney 6 – Spirit of Justice). What perfect timing. Morizumi: It is indeed very well timed. Tsukanaka: There was no way we would know about that, so it’s really just a coincidence (laugh). Interviewer: Was it difficult having the characters from the Gyakuten Saiban series appearing in a game in a different genre? Eshiro, Well, like I just said, I didn’t have to do many corrections as part of the supervision work itself. But the schedule was rather pressing, and it was quite stimulating (laugh). Morizumi: I’m sorry for keeping such a tight schedule for the supervision (laugh). Tsukanaka: We had to ask supervision from games in different kinds of genres and from different companies, so the schedule norm was different for everyone. It didn’t seem that tight, but I understand if even within the same company they’d go: “Can we really make the deadline if we’re having this talk now?”, so we all kept the other on their toes. Morizumi: In general, we went with the scenario we prepared. Supervision was mostly focused on having the correct ending of sentences, or certain manners of saying something. I’m grateful they didn’t check the all-important scenes extensively. Eshiro: Yes. It was basically perfect in one go. Interviewer: By the way, the Naruhodo and Mayoi who appear in PXZ2, from when do they come in the timeline of the Gyakuten Saiban series? Morizumi: We proposed to have them be the characters from after the ending of Gyakuten Saiban 2 (Ace Attorney 2 – Justice for All). In Gyakuten Saiban 3 (Ace Attorney 3 – Trials & Tribulations), the characters are all matured, so we wrote the scenario with the characters just before that. Tsukanaka: The Gyakuten Saiban series has a pretty interesting place in the scenario. They appear in the second chapter, so you can get a good look at them in the demo, which is out now. They first appear in the Kamuro-chō of Ryū ga Gotoku OF THE END (Yakuza Dead Souls). Morizumi: The story of PXZ2 starts with the premise that Naruhodo has already once defended Majima Gorō from Ryū ga Gotoku OF THE END. Tsukana: And his new client is Mishima Heihachi from the Tekken series. He’s open for any sort of trial (laugh). Morizumi: In PXZ2, we portray him as a defense attorney who is well sought after. And because he’s not a fighter-type of character, he’s in the position of someone with common sense. Many of the other characters don’t think anything of monsters from a different dimension of time traveling. Interviewer: True. Ryū or Ken from the Street Fighter series don’t get surprised no matter what World they get into now (laugh). Morizumi: They’ll just say that world looks interesting and then go fight like usual (laugh). There are many characters like that in the game, but Naruhodo is the one with common sense, who will say: “Eh, there’s nothing interesting about all this. How are we going to get back.” It might be strange to say he gets this in return, but we wrote Naruhodo with the image of him of someone who fights with words. He’ll pick up on the information the enemies accidently let slip, saying “What you just said is strange!” , point out the contradictions, see through the opponents’ plans. The original Gyakuten Saiban games are about the court battles, where you figure out the contradictions in the opponent’s story and turn the case around. Interviewer: Ah yes, originally the Gyakuten Saiban series was known as a court battle adventure. So having the characters fight with words does fit. Eshiro: They do indeed fight each other with words. Tsukanaka: Because of this, Naruhodo and Mayoi have the function of leading the story and there are quite some scenes where they shine. Interviewer: In PXZ2 there are not only few people with common sense: there are few normal humans in general. Morizumi: If you say Ryū and Ken aren’t normal humans, then yeah, there are few of them (laugh). Eshiro: If you go like that, perhaps Naruhodo and Mayoi are really the only normal humans there (laugh). Morizumi: They don’t any martial arts or don’t have weapons, so I guess you’re right in a way. Tsukanaka: They are normal people, but there are many unique characters in the original Gyakuten Saiban series, and they really do fit well among the other allstars in the game. Interviewer: But PXZ2 really has too many weird characters (laugh). Eshiro: Only people who’d you never see in a real Gyakuten Saiban game (laugh). Interviewer: It’s a late question, but why are the two of them one Solo Unit? You could have made a Pair Unit with them. Morizumi: If we made them into a Pair Unit, we’d need to prepare a lot more moves for the characters. Tsukanaka: It’s okay when the original game has a lot of moves. But in other cases, we’d just be hurting the originality of the characters if we came up with our own original moves. Morizumi: We also thought about having Naruhodo appear all on his own as a Solo Unit. So it’d be like how he was in UMVC3, where he’d call out Mayoi during battle. But rather than having Mayoi hidden and only come out whenever called for, we thought it'd be much more like Gyakuten Saiban if you would have the two of them talking together. It’s much easier to show off the feeling of the series. And we can have both of them do things in the story, so that’s why the two of them become one Solo Unit. They are a special team from an adventure game, amidst all those martial artists, sword fighters and other fighting people. Interviewer: Could I ask you again what makes Naruhodo and Mayoi special in this game? Tsukanaka: I talked about the demo just now. Users can play three chapters there, up until they get into the Demon World. I think that among the users, there will be people who thought: “How are Naruhodo and Mayoi going to fight?” when they first heard Gyakuten Saiban would appear in PXZ2. In the demo, it is explained why Mayoi can summon Tonosaman and Himesaman. Morizumi: In Gyakuten Saiban 2, Harumi (Pearl) sends spiritual power in Mayoi’s magatama, and that’s how you get to see the Psycho Locks. In this game, it’s Morrigan’s devil power that is put into the magatama, so it becomes even stronger. To be more exact: whenever Mayoi’s in trouble, she’s able to materialize the characters she’s thinking off deep within her. And those characters are Tonosaman and Himesaman. Psycho Locks also materialize, and actually restrain the enemy. Tsukanaka: The Gyakuten Saiban series is already shown off in the demo, so I’d be happy if people tried it out before the release. Just try it out to see how Naruhodo and Mayoi get involved in the story. And it’d be nice if the people would then play the rest in the main game. Interviewer: And after they’ve finished that, they can play Gyakuten Saiban 6. Eshiro: I’d be happy if they’d play Gyakuten Saiban 123 Naruhodō Selection (Ace Attorney Trilogy), Gyakuten Saiban 4 (Ace Attorney 4: Apollo Justice), Gyakuten Saiban 5 (Ace Attorney 5: Dual Destinies) and Dai Gyakuten Saiban (‘The Grand Turnabout Trial’) (laugh). But seriously: Gyakuten Saiban had a guest appearance in our own fighting game, and we also made a game together with Level-5, but the characters have never before appeared in a strategy-RPG, and this is a very rare occasion. So I think that fans of the Gyakuten Saiban series will be able to see a new side of Naruhodo if they play PXZ2. And I’d also be very happy if people who haven’t played the Gyakuten Saiban series will pick it up after they see the characters in PXZ2 (laugh). Interviewer: The characters are based on the characters from right after Gyakuten Saiban 2, so people might PXZ2 even more after playing Gyakuten Saiban 123 Naruhodō Selection. Morizumi: We made it so people can enjoy PXZ2 without first playing that game, but I think you’d enjoy it even more if they did. Interviewer: By the way, what is the estimated play time of PXZ2? Tsukanaka: The overall playtime is probably about the same as the previous game. Morizumi: But the battles have become easier to play this time, so the battles won’t take as long now. In return, the story side become bulkier. If you really want to get into the game, you can also take your time. 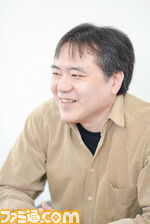 Tsukanaka: We’ve tried connecting the chapters better compared to the previous game, so that’s where the story become more bulkier. Interviewer: So the story was more volume now? Morizumi: It is a lot bigger. Morizumi: We got a lot of people saying: “It’s a crossover, so have all the characters talk” about the previous game. So we made a scenario, including dialogues, that should satisfy the users. 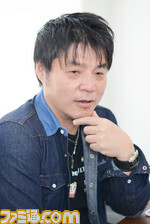 Tsukanaka: But it was difficult in regards to the development time because of that (laugh). Eshiro: You must all have been nervous at the development floor. I know the feeling (laugh). I was shown it chapter by chapter, but even though the story is really compact, the characters are portrayed really well. Tsukanaka: I’m really happy you say that. But we took so much time, in the end we had to ask everyone to check in order of appearance. I am terribly sorry. Eshiro: But there was little I had to change in the latter half of the project. In the earlier talks, we managed to get a hold on the correct way, and you made it pretty much like we had discussed. The art of the two really looks good. We usually ask our own designers, or the illustrator Iwamoto Tatsurō (character designer of the Gyakuten Saiban series), but it feels fresh to see Naruhodo and Mayoi with a new, fresh touch. Interviewer: To take the topic outside of games: The Gyakuten Saiban series had done all kinds of collaboration projects now, but how was it collaborating with different companies? Eshiro: Very interesting. We’re doing all kinds of stuff with Gyakuten Saiban, but by having the characters appear in a work that transcends genres and companies, I hope they catch the attention of people. I hope they’ll think: “Who is this Naruhodō Ryūichi guy?” and get interested in the Gyakuten Saiban series. And the other way around: I think people who usually play Gyakuten Saiban might be interested to see how Naruhodo fares in a strategy-RPG and then gets interested in other genres. I think there is a good, mutual effect. Tsukanaka: I am very grateful that you allowed Gyakuten Saiban to appear in our game. It’s a very timely work, now that it’s been announced you’ll be having a TV anime. Eshiro: Yes. As if we planned it like that (laugh). Morizumi: It really does look like that! But as we’ve been working on this for two years, it’s just a coincidence (laugh). Eshiro: Actually, this had not been decided yet two years ago. We actually just barely managed to Gyakuten Saiban 6 ready to appear at Tokyo Game Show 2015. Interviewer: When did you announce Gyakuten Saiban 6 actually? Tsukanaka: During the supervision period, I heard that Mr. Eshiro’s team was busy, so I figured they were working on something, but I couldn’t have guessed that they’d have that done already at Tokyo Game Show 2015. Morizumi: And they had a demo ready together with the announcement. That’s really amazing. Eshiro: We really overdid it this time (laugh). We also overdid it with Gyakuten Saiban 5 though. Interviewer: Overdid it (laugh). But it’s almost destiny that PXZ2 is released right now, don’t you think? Eshiro: I really think it’s perfect timing. The scenario is good, so I think it’s a good occasion for fans of the series to see a different side of Naruhodō Ryūichi to see a different side to him. Interviewer: He’s doing something very different from usual. Eshiro: Really different. When I first heard he’d be together with characters from Ryū ga Gotoku OF THE END, I tried imagining the scene, but it turned out surprisingly well in the game. Eshiro: Yakuza and an attorney. It’s a bit too realistic a combination (laugh). Tsukanaka: We didn’t just put them together because it looked fun, there’s a reason for that in the story (laugh). Morizumi: Majima Gorō does look very unique, but he’s really not that dirty a character (laugh). Interviewer: Were there any comments from Sega about this team-up? Tsukanaka: They looked very carefully over the characters' personalities, but they left everything that had to do with the story and the crossover up to us. Morizumi: The worst thing with these kinds of crossover games is when the company tells you they don’t want a certain team-up. Because we’d have to rewrite the whole story. Luckily, this has never happened. In terms of supervision, sometimes the supervisor will just leave the dialogue of the characters all up to us, while other supervisors might have the main scenario writer of that series give detailed orders. It all differs per series. Like we just said, with the Gyakuten Saiban series, it was mostly checking the sentences and the exact spelling of terms. Eshiro: Oh yeah, I did not say not to do certain team-ups. Once you do that, there’s no meaning in having Gyakuten Saiban appear in your game. 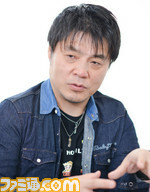 Tsukanaka: In these kinds of crossover games, we want to show the users what they want to see, but also surprise them with things they had never expected, so i’m happy the companies understood that. Interviewer: By the way, Mr. Eshiro, have you already seen the game in action on a real device? Eshiro: No, I have checked the footage, but I haven’t seen it running on the actual machine yet. I’m looking forward to seeing it. Morizumi: I thought you’d say that, so I brought it with me. Tsukanaka: This is the limited Original Sound Edition, with the original music as BGM. So the original songs from the games or anime. Eshiro: They really move around a lot. I love this, this playful feeling. The first three Gyakuten Saiban games, they are quite limited in number of animation patterns. In Gyakuten Kenji (Ace Attorney Investigations), the Investigations parts became like here in PXZ2, with little characters you move around, but they are a lot more animated in this game. It might be the first time Naruhodo and Mayoi move around at this size. Tsukanaka: Now you mention it, their size is close to the one used in the Investigation parts of Gyakuten Kenji. Eshiro: Mitsurugi Reiji (Miles Edgeworth) was the protagonist in Gyakuten Kenji, but to draw Narohodo at this size, your artists must have done their best at the pixel art. Morizumi: We had very experienced veterans working on the pixel art. To have this many characters and animations, and also in this quality, you really need the skills and experience of people who have dotted for a long time. Eshiro: I’d like to see a bit of pixel art again. Only technicians can do that work. When we still used cathode-ray tube monitors, we’d even think of the color of two pixels bleeding into each other and work on the graduation. But there’s no occasion to teach this know-how to others (laugh). Interviewer: So you would want to make a sprite-based game even now? Eshiro: I really would. We went for polygons with Gyakuten Saiban 5, but we had to think long about whether to go for polygons, or stay with pixel art. Sprite-based side-scrolling games used to be the specialty of Capcom, so if I had the chance, I’d want to make one again. Interviewer: What do you think about the pixel art of the characters for PXZ2? Eshiro: I am really happy with it. Because I know very well how hard it is to have sprites move around like this. Polygons and pixel are completely different things. With Gyakuten Kenji 2 (‘Turnabout Prosecutor 2’) we made the characters first move around with polygons, and then remade that in pixel art. That’s how much I love pixel art. Interviewer: Pixels do have something unique to it. And now for the final question, but could you say something to the people looking forward to PXZ2? Eshiro: Like I said earlier, you usually can’t see Naruhodo and Mayoi working together with works frorm other genres, so I hope you all can enjoy that. We made sure that the dialogue and the way the Gyakuten Saiban series is portrayed won’t betray the expectations of the fans. It’d be great if you would first play the demo of PXZ2, then the main game, and then look forward to Gyakuten Saiban 6, to be released in 2016.